Next up for City are Bolton Wanderers, so as usual MFW could once again only turn to the Bolton born and bred Tim Sheppard – as in City’s long-standing physio legend, Hall of Famer and supporter of both the Canaries and the Trotters in equal measures. And the only physio in my knowledge to have received a testimonial – featuring my beloved Celtic. A great night. As my back has been causing me problems for some time I thought I’d get Tim to evaluate the situation as well as discussing Saturday’s fixture, so off went Mrs P and I to speak with him at his premises within the Global Clinic at, appropriately, Colney. After an excellent analytical session on my back and some very pertinent advice about my lifestyle choices from Tim, including some exercises (one of which involves me holding my stomach in at every lamp-post I pass – very easy while walking a male terrier – plenty of opportunities!) and other things I should do to improve my lot in life we had a chat about the Trotters. Ins: Jason Lowe (Birmingham, free), Erhun Oztumer (Walsall, free), Clayton Donaldson (Sheffield United, free), Pawel Olkowski Cologne, free), Yanic Wildschut (Norwich, loan), Marc Wilson (Sunderland, free), Josh Magennis (Charlton, undisclosed), Jack Hobbs (Nottingham Forest, free), Luke Murphy (Leeds, free), Gary O’Neil (Bristol City, free). And of course Remi Matthews (loan with view to purchase). Outs: Derik Osede, Dorian Dervite, Jem Karacan, Jan Kirchhoff, Chinedu Obasi (all released), Ben Amos (Millwall, loan), Chris Taylor (Blackpool, free), Mark Howard (Blackpool, free), Jeff King (St Mirren, free), Aaron Wilbraham (Rochdale, free), Darren Pratley (Charlton, free), Filipe Morais (Crawley, free). So what does Tim make of that? Every single Bolton recruit is a free or a loanee. Not easy for any manager. Phil Parkinson is doing a very good job – a sterling effort – but he is basically hamstrung by financial restrictions. I’d be surprised if any wealthy person from the USA or, say, an Arab nation would take us on as things stand. But you started off like the proverbial rocket? We had a great win over WBA and a couple of others at the start of the season. Obviously, it’s tailed off from there. So how do you see Bolton’s future? They’re not where I’d like them to be. I want them to back at the highest level. And with some individual investment, there’s no reason why they can’t. 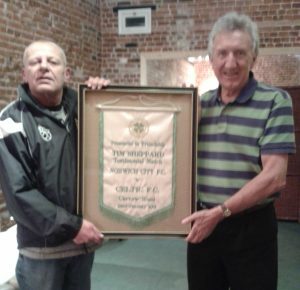 Tim and Martin at the Global Clinic proudly holding the framed Celtic pennant presented to Tim at his testimonial. Tim missed the corresponding fixture last season as he was on holiday abroad (he didn’t miss much as we all know, Norwich and Bolton supporters alike). I asked him if he was going this time around. Yes, I’ll be in the front row of the Directors Box and I’ll be wearing my flat cap! Now I occasionally wear my very own flat cap in the Barclay but that’s something else. Respect. Tim has a very dry sense of humour but I’ll believe him! 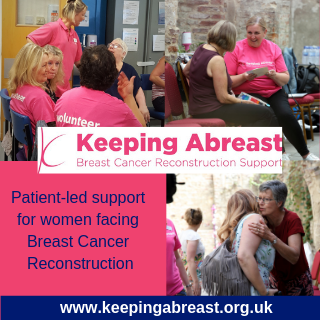 And we cannot end without one of Tim’s anecdotes – this one was volunteered rather than asked for. I’m a member of the IWTC. So what in the name of the good Lord is that then? It’s the I Was There Club. After our Inter Milan UEFA Cup ties, we formed it and meet up about three or four times a year. 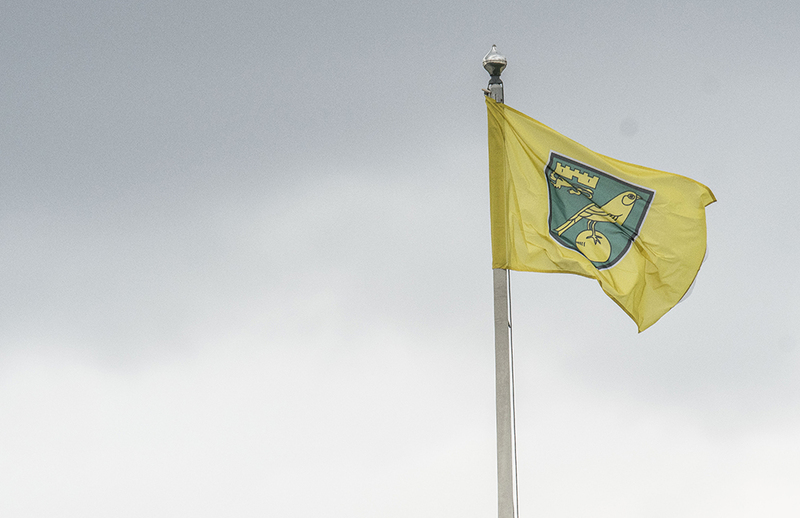 We talk about all things Norwich City and I’m looking forward to our 25th-anniversary dinner. So what’s the score going to be on Saturday? Many thanks to Tim for his treatment, advice and his time. And to Sue for taking the picture. Penney predicts: We seem to have found a way of getting at the “lower echelons” so I’m going 2-0 City. Gaz guesses: Am braced for another goalless first half (kicking toward the River End of course) but am confident we’ll have enough to cruise past a stubborn, hard-working Bolton. 3-0 City. Cookie concludes: There are bound to be hiccups along the way, but it’s a brave person who goes against City right now. City 3 – Bolton 1. Stew suspects: If we can beat Rotherham, we can beat Bolton. Hopefully won’t leave it all till the second half. 2-0 City. The “oppo”: It’s got to be 2-0 City. It’s sheer logic. Fake and the team are doing so brilliantly right now: great football, inspirational youth, and rejuvenated experience players. Canary heaven. So why am I so apprehensive? Surely ‘Along came Norwich’ is dead and buried. That admirably sums up how 99.9% of us feel. We’ll surely have too much for Bolton though. Tim Sheppard thinks so too and that’s good enough for me! I assume that these predictions were made before DF was awarded Manager of the Month and without the knowledge that I’ll be at the game-both situations are likely to cause a jinx. As you’re in the Snakepit tomorrow there won’t be a jinx! well as already suggested it could be ACN moment but Wildshut and Mathews are both not available for this came and I can’t see Bolton Wackoing city. They just might try high long balls to get past the midfield . With the financial problems I think Bolton will not take up the oppsion of buying Matthews or Wildshut unless a new owner takes over. I enjoyed yesterday’s Whacko! chat, I really did. But as you say it’s all down to what happens on the pitch. With our wonderful young fullbacks coupled with Klose and Zimmermann I reckon Bolton can hoof it up all they like and we’ll deal with it..
We’ll break them down (fingers crossed). My articles always seem to veer off-topic – just my style I guess. I grew up with Dad listening to Round the Horne and The Navy Lark on the radio and Sgt Bilko was always on the TV when available, together with any football or boxing match. Julian and Sandy was very risqué in it’s day as I realise now. I didn’t then. Hancock? Never quite got him although “a pint – that’s nearly an armful” will forever stay with me. If editor Gary allows it we might well have an MFW TV week during the close season – I’ve already written my introductory piece but haven’t got the guts to submit it to him until next June! For now let’s hope City continue on this current. magnificent path. Even if BW want to make the Matthews move permanent would he want to stay if his mates are not being paid? As he’s on our books I assume we are still paying him, and then recharging them, so for the moment he and Yanic should not be out of pocket..
That’s a difficult one Keith. If push comes to shove which is indeed possible I guess Remi would simply be “released” by NCFC. I doubt Daniel Farke would wish him back under current circumstances. As I’ve said before on MFW I’ve only seen Remi play once so I don’t feel equipped to comment on his abilities or otherwise. This will be the original “wait and see” I guess. C’mon Don; surely, surely AlongComeNorwich is dead?? I sincerely hope so, and given the disarray Bolton find themselves in, even a Jonah like me has to go for a home win…. 4 – 0 would suit very nicely I think! I reckon four is a little optimistic but I sure hope you’re right. And Daniel Farke certainly deserves his recognition – I don’t believe in hexes and curses tbh. I’ll wear my lucky socks to help offset the risks. Does that mean I have to wear my yellow and green boxers? I’ll have to seek them out after this evening’s bath. I really do own a pair which I believe came from Lidl. Mrs P’s thoughtfulness knows no bounds. I guess every week we’re all going to wonder if this will be the game when we fail to focus and have a blip, totally against all form and predictions, until it actually happens. I don’t think it will be this week – I’m going for 3-0 to City. We will not fail to focus. The Bolton squad will be angry as they might not have been paid before kick-off – but who will they take it out on? Farke will make sure it isn’t us. Never felt more confident before a game. Oh Jeez! 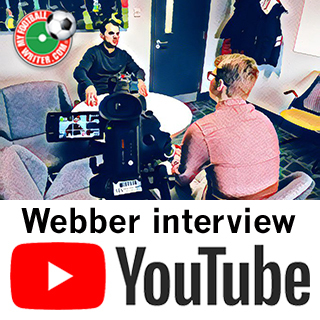 Interesting comment from DF during today’s press conference regarding Tim Krul (tweeted by Michael Bailey) ‘”….Farke says they’ve discussed things together, there were too many rebounds in recent weeks, that Tim is self-critical – but in general he is at a high-class level”. Typical DF – has clearly laid down a marker for improvement but is backing him (for now?!). As for predictions, I try not to!! Its just my ingrained football supporters paranoia!! However, I think league positions are irrelevant in any football match, we should know from last season that this is still a Phil Parkinson side and they will be organised and very difficult to break down. So we as fans will have to be patient (as has been the case this season). It could go the same way as Rotherham last week where the space we need in the final third isn’t there until the second half. I agree with you. DF has made Tim Krul one of the first names on the teamsheet and imo Krul is no bad option. Sure he’s made mistakes. So have many PL keepers (De Gea comes to mind straightaway). To me, who has played at GK in emergencies at a much lower level, a wet, basically greasy pitch does not help him – or indeed anybody. I love the way Tim Krul sorts out our back four (even when it rarely becomes a three or five). I’m happy to stick with him – especially when you might consider the only available alternative! I agree with all of that and yes I am also happy with TK. It appears both he and Jordan Rhodes are those experiences heads around a very young team this season. However, that said it does show how good Gunny Jr. was last season. Gunny Jnr was indeed great for us and the fact we have two excellent previous goalkeeping loanees on the self-destructing Soton’s bench (at best) slightly irks me. What’s gone wrong with Fraser Forster? It wasn’t that long ago that we were singing “one more year” to him. I’d welcome him back. I wouldn’t underestimate Timm Klose’s influence in bringing the youngsters through either! I would not be surprised if it turns out to be another 3 – 1 “comeback” against a side fighting for their lives.